Interested in becoming part of our medical team? Dialysis at Sea Cruises is offering our medical staff the opportunity to experience the excitement of cruising to majestic ports of call throughout the world, vl/nile enabling the dialysis patients the freedom to cruise with conﬁdence, knowing their shipboard medical needs will be handled by qualiﬁed and trained professionals. Dialysis patients can cruise with family and friends on their dream vacation, with the assurance that their dialysis treatments can be provided onboard ship throughout the world with the assistance of our trained medical staff. Our program is designed to ensure that the dialysis patient has the absolute best and safest dialysis treatments possible onboard a cruise ship. 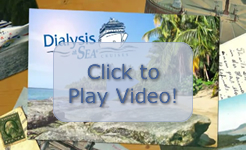 We use the Fresenius 2008K dialysis machines on all of our cruises and expect our staff to be proﬁcient in its use. In order for us to achieve our goals, we seek qualiﬁed, responsible and dedicated medical personnel that share the same vision and level of caring, as we do. If you are interested in helping dialysis patients enjoy life please consider this 'working vacation'. It is a wonderful opportunity for both the medical staff and the dialysis patient to cruise to some of the most exotic destinations in the world while relaxing on some of the most luxurious and beautiful ships on the high seas.